I've been thinking a lot lately about how using the internet has all but killed the art of letter writing. I used to love to hand write letters, and have written hundreds upon hundreds in my years. I hear they're still out there...friends have told me they have kept them...and that is also thought provoking to me. It's like my history is spread out around the country in little envelopes. There was a time when families kept oral histories, and if you're one of the lucky ones, perhaps you have old family correspondence to reflect back on, as well. My neighbor Kathy was telling me recently about a diary that has been passed along in her family, written by a woman in her family in upstate New York in the 1700s. She has offered to share it with me. After listening to her talk about her family history, it made me wish I had a decade to devote to studying her family and perhaps writing a book about it. I know so little about my own family history, but then, maybe that's OK. I can write my own history, can't I? I have two friends who will still write letters once in a blue moon. Nowadays, we're all too "busy" to take that time. The time I spent writing letters with my morning coffee is now spent on the internet. It's a different world, and I'm not saying I don't like it...I just worry that one day, our kids and their kids won't have much of us to reflect back on, between digital photos and e-mails. How can we make sure that doesn't happen??? Martie. Yes, different world. What a good piece you have written. The 1700s diary has survived for over three-hundred years. Digital stuff, how long? My earliest e-mails that I have hard copies of, go back to 1998--twelve years. The art of writing letters has almost been killed. 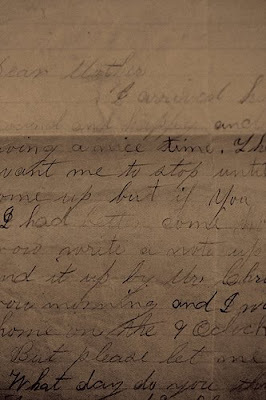 The last personal family letter I wrote was in December to my Aunt Helen, ninety-years old. She won't call or e-mail, but she will write me. Sigh. Your post goes down deep inside me. The letters we used to get: in script of the person who wrote it, smudges of their sweat or tears or even blood from a battlefield, the perfume or cologne, the envelope carefully or not so carefully sealed, the selection of stationary or notepad to write upon, the enclosed clippings with jagged edges from scissors they also sewed with, the color of the ink, the rapid cursive, the slow cursive; then year after year of corresponding, you can see the frailty of life, the diminution of energy, the script losing its youthful character by the reading of letters through time as you have kept them in a file or wrapped up with ribbon in the hope chest or bedside drawer; and, finally, after they have passed or faded away, we can bring out their letters and know them again by their cursive and the scent of their page. No e-mail can approach the life in the letter. All that being said, we that blog wouldn't have known each other if it had not been for the internet. But, still, I'd rather touch the flesh and see the script than the QWERTY. Martie, we need to write and make sure we have hard copies. I just don't know. Make sure our kids have our passwords? So they can get into our stuff? I just don't know. Good post, Martie. This has been on my mind too Martie. It has been decades since a Hand Written letter left my desk and they were sporadic at best. More consistent communication began with my first computer in the late 80's. My writing began to open and letters flowed. Then the internet and email arrived. The people I’ve come to know around this globe, through email and now blogging, stuns me. Not through one-liners but interesting, thoughtful exchanges. Without written conversations even folks near by, due to years of out of sink schedules, would be lost to me without these mediums. Letters are still written, though rarely by hand. I have hard copies of some, not all. I too am saddened by what was and what is. Mostly for the historical loss. Being a long time family researcher, there is nothing more exciting than running into those old letters and written down stories. But here’s the thing...for folks irritated by misspelling, my handwritten letters would have evoked ire. My early years were spent with adults which caused my vocabulary to grow quickly. Unfortunately, in a different direction than my spelling skills. As a sponge for the sounds of words and their meanings, reading was a pure joy. As soon as possible my thoughts sought pencil and paper. Today there would be an explanation for my speaking/reading vs spelling disconnect. In the 1950‘s, it was lazy. Old history. Enter the computer and spell check. Not a crutch, a teacher. Letters, love typing them! Love finding the old ones! Jack: Boy, you hit it on the head. I remember my dad going berserk because they didn't teach us "The Palmer Method" cursive in school. His handwriting was absolutely gorgeous, and, as you said, I saw it quavering as he aged. Having said that, I will say that what I write on the internet is pretty guarded compared to what I might have written in a piece of personal correspondence. I find that sad, but having this is better than no written contact at all. I thank you all for being there. It's a joyful part of my life, and I feel honored to share in the stories of others. Martie, that was a good post, and seeing the actual letter in the picture makes you realize how much more you get with a letter, than you get with cyber notes (they are good but just not the same). I am looking forward to the books, and deciding what to send to you. I have one for sure.....I'll roam the shelves.